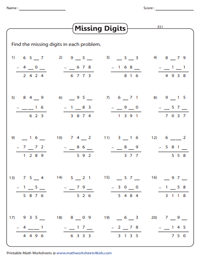 This huge collection of worksheets will test your child's prowess in 4-digit subtraction. Apart from the standard range of subtraction problems in column and horizontal formats, a wide range of interesting themes like grid subtraction, find the missing digits, decode the riddles and line up subtraction are also included here. Our well-researched word problems are also sure to keep your children thoroughly engaged! 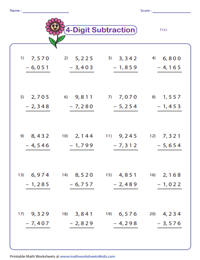 Boost your child's expertise at subtraction with this array of worksheets. 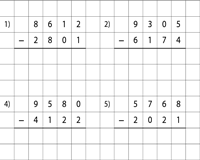 Subtract 3-digit or 2-digit numbers from a 4-digit number involving the regrouping feature. 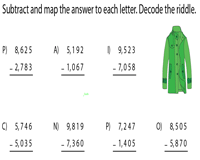 Simple and intriguing word problems involving 3-digit or 2-digit taken away from a 4-digit number with the regrouping feature are included along with practice exercises for a better learning experience. 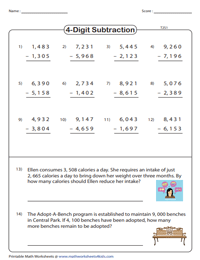 This collection of worksheets encompasses exercises to practice 4-digit subtraction. The subtraction drill here serves best for providing ample practice to master subtraction along with the borrowing feature. Incorporate the printables here with interesting word problems that include take away of 4-digit number from another, along with extensive subtraction practice drills. 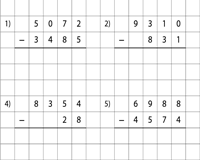 This compilation of grid worksheets is sure to help children review their skills at subtracting 2-digit, 3-digit numbers from 4-digit numbers on grids. Packed in this set of printables are exercises on the grid to subtract a 4-digit number from another 4-digit number. Gain mastery in subtraction by working out these practice exercises. 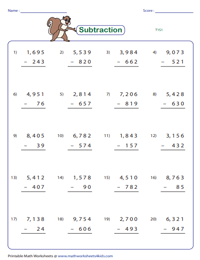 Add or subtract the numbers to find the missing values in each subtraction problem. The worksheets have been split into two degrees of difficulty. What never asks question but is often answered? Find the answer to this and other riddles by solving the subtraction problems! Match the answers with the letters to decode the fun riddles! 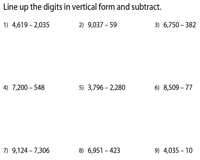 Students will need to rearrange the numbers in a vertical format to solve these 4-digit minus 2-digit, 3-digit, or 4-digit subtraction problems.